Deutsche Bank’s upcoming strategy decision boils down to a tradeoff between costs and stability. The German universal bank’s management is likely to offload either part or all of its retail business when it updates investors this quarter, says a person familiar with the executives’ thinking. Co-Chief Executives Anshu Jain and Juergen Fitschen should go for the former. The conservative option would be to exit only the 155 billion euros of assets that make up Postbank, retaining the universal banking model. Yet even excluding Postbank, retail banking expenses eat up a hefty 79 percent of revenue – compared to an average for its peers in that business of 58 percent, Citigroup analysis shows. This would need hacking back, given that investment banking, wealth and global transaction banking are already being cut, and there were 800 million euros of new regulatory costs last year as well as a larger bank levy. The nuclear option – setting itself up as a European version of Goldman Sachs by selling all 258 billion euros of retail assets – would turn Deutsche into a distinct investment case. Putting investment banking front and centre would make economic sense, given that retail banking managed a meagre 6 percent return on equity last year. And if Jain and Fitschen could shed another 100 billion euros of assets from the investment bank they would be able to deal with the fact that an impending Basel requirement known as the net stable funding ratio would be harder to achieve without stable deposits, reckons Jefferies. But a wholesale-funded entity could itself be costly to fund, and could also be problematic in any future crisis. Both Goldman and Morgan Stanley became bank holding companies in the wake of Lehman Brothers’ implosion. The European Central Bank, Deutsche’s new regulator, might have qualms were its new charge to move in the opposite direction. So might German taxpayers. So a Postbank spinoff – followed by further clampdowns on costs – looks preferable. To do so, Deutsche will have to face down the Verdi union seeking higher wages at Postbank via strikes. It should also accelerate plans to shutter as many as 250 bank branches. But as Jain and Fitschen are discovering, sometimes there are no easy choices. 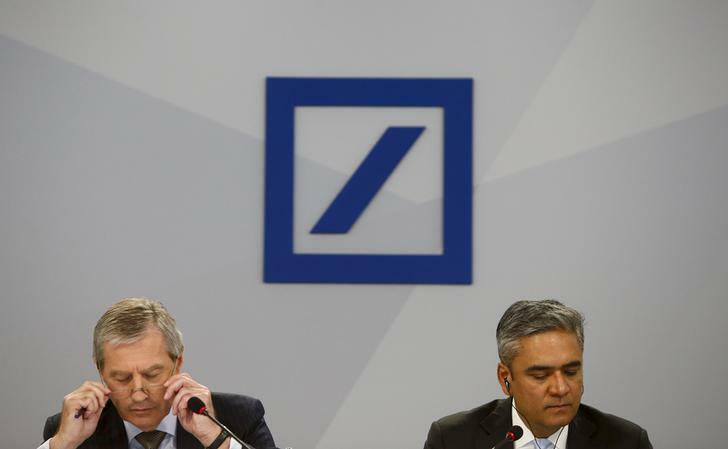 Deutsche Bank’s management is weighing up whether to sell just its Postbank subsidiary or its entire retail business, as it prepares to update investors on its strategy this quarter, according to a person familiar with its plans. Although executives were initially considering five scenarios, the shortlist has narrowed to two, this person said. One of those would see Deutsche list the remaining 94 percent of its Postbank retail unit, as well as making cuts in its investment bank. The other would entail separating off both Postbank and the rest of Deutsche’s retail business into a separate entity, leaving behind a wholesale banking group.